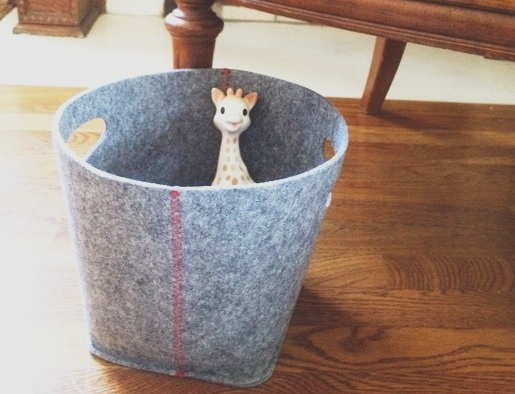 The other day I happened to come across this small, inexpensive gray basket. It is made of sturdy felt and has cut out handles making it easy to tote from room to room. I don't know if you have little ones who like to bring a collection of small things with them everywhere they go, but if you are like us, this will come in handy. I love how it is perfectly sized for my two year old and has no sharp edges for him to bump into when he walks fast (runs) throughout our house. I looked online to find a link, but sadly did not find it. Check your local Target for this one priced at a mere $4.99. Or even better, if you have a heavy duty sewing machine you could whip up one yourself!